Hello fellow gamer, thank you for reading my blog. 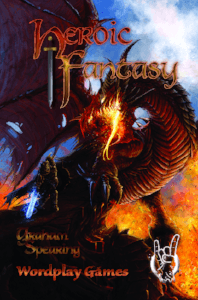 Heroic Fantasy? What do I mean by that? The genre? What Do You Need to Know About Heroic Fantasy? Heroic Fantasy (the game) touts itself as a heroic variant of the old school game The Black Hack (TBH). Heroic Fantasy (HF) has nine classes, a race and alignment system, more spells, magic item creation, PvP. And more. You can buy the 85-pages-PDF for USD $5.95 here (aff). The print+PDF-bundle costs $13.95. I got a review PDF from the author, Graham Spearing. This is a reading review. How does Heroic Fantasy compare to The Black Hack? Where does HF fit into? I see HF as a set of house rules to TBH, although it's a stand-alone game. It feels almost like the same game, but catered to a different gaming table. What does Heroic Fantasy add to TBH? I felt that TBH left a lot open to interpretation because of its small page count. HF remedies that. The author explains the rules in greater detail. The book contains a section with tips for players and the Game Master. The changes to character creation come to mind. HF adds dwarves, elves, and halflings. Dwarves get a Usage Die for natural armor but get Disadvantage on keeping their spell slots. The rules for elves and halflings follow the Tolkien scheme, too. If a halfling manages to have two breakfasts before elevenses then they are indomitably cheered and will automatically succeed at one test whilst digesting throughout the day. Players can also choose between three alignments (Good, Neutral, Evil). The classes feel like old friends in new garments. Very familiar, but adjusted towards TBH's mechanics. You can pick between nine classes: Barbarian, Bard, Cleric, Necromancer, Paladin, Ranger, Rogue, Warrior, Wizard. Bards and Necromancers come with their own spell list. The Ranger has a Precision Strike and an animal companion. Paladins can Lay on Hands and must follow a Geas. And so forth. I like the Rogue. It's a catch-all for the professions in the gray area. At first level, you have one specialization, e.g. Tomb Robber or Charming Swindler. You get another at 4th and 8th level. The gimmicks from the TBH Thief are spread between the different specializations and new ones were added. So the focus is narrower. The Warrior is similar to TBH but gets a Power Strike and a Signature Strike. And players can customize their characters with two Aspects. Yes, those that made Fate popular. E.g. "Celebrity chef to King Dravok the Unsteady." Bonds are another addition, this time from games like Dungeon World. When it comes to the main rules, there are some tweaks, too. Interestingly, you see a nod towards indie narrative games with the Fate rule. The Game Master (GM) introduces a new detail to the story if you roll exactly equal to your stat on a test. You might dislike the fact that this rule breaks the standard task resolution. When you roll a d20, you must roll under your attribute to succeed. So an equal result should count as a failure. With this new rule, the GM can decide if the test was successful or not and insert the new story detail. I'm not sure if this rule is necessary. As a GM I can add a twist whenever I like. At least that's how I play it. What about armor? In both TBH and HF, armor absorbs damage. Yet in HF armor mitigates slightly more damage (e.g. plate mail 12 instead of 8). The Usage Die mechanism offsets this. The players must roll the UD. You must reduce armor points when you roll a 1 or 2. You can repair your armor for coin, though. But don't forget that monsters deal less damage than characters of the same level. A 1 HD (Hit Die/Dice) monster only attacks for 2 damage (1d4). The GM must make sure to throw monsters of higher levels at the PCs so that they pose a challenge. I'm not sure if HF's higher armor points help here, even if you take damaged armor into consideration. Ambush rules and rules for hordes extend the combat system. The horde mechanism simplifies how the GM can handle multiple opponents. I also like that HF includes an easy solution for Player vs. Player and rules for magic items. The ideas for creating magic items are mechanical instead of flavorful but that's ok.
A bestiary rounds up the book. At its core, I see this book as a set of house-rules. It is in the same genre like TBH (Fantasy/Heroic Fantasy). The power level feels nearer to newer editions of D&D than to the grittiness of the earlier versions. The additions are worth the price if you want more options for your TBH-game. But I don't see it as an "own new game" like some other TBH hacks. You could pick and choose what you want to use and slap it on the core engine. Don't like the narrative task resolution but want to keep the PvP? Easily done. New classes, more spells, and monsters, extended combat rules, magic item creation, deities, an adventure.... moar stuff! That's good, right? I like the addition of Aspects and Signature Weapons/Strikes for character creation. I don't see the need for the Fate mechanism. It is The Black Hack extended and tweaked. You won't like Heroic Fantasy if you don't see the merit in The Black Hack. Perhaps characters are too powerful. They sport a good amount of hit points and easier spellcasting than in traditional old school D&D. Pair this with strong armor and high damage output. Oh, my! The book's layout is simple and readable. Nothing too fancy and it serves the purpose. Good set of house-rules. It could have been advertised as such instead of packaging it as an own stand-alone game. But now you have everything in one place - that's nice, too. The price is fair. Get the game here! (aff). P.S. The big list of The Black Hack Resources is here. Take a look at the free SRD, too.